My first encounter occurred while visiting a family friend in Willow Creek California in early June 1972. While visiting, my twin brother, and two family friends daughters went ... See More hiking on an old logging trail located behind the friend’s house. We hiked about 1 hour up this road and were getting ready to turn around, when off to the road in a small gulley filled with ferns. We all stood on the road looking up the gulley after we had heard some grunting noises. Setting about 150 feet from us was a tall creature with long dark brown hair. The creature was standing among the ferns I think it was eating the tops of young ferns. It just stood watching us for about 1 minute, then it grunted. The girls we were with said that we needed to go so we left, I remember running all the way back to the house. When we told the girl’s parents the father was concerned and told us not to go back up the road. On our way to my aunt’s house in Gresham Oregon, I remember my mom telling me that her friend’s husband called a couple of men and they went up the road. She also said that he turned on the electric fence around their black berry/boson berry patch. He told my mom and her friend that he did that to keep out the bears. The creature as I remember was about 7 feet tall with long dark brown hair. I could not tell if it was male or female. It seemed more interested in the ferns than us. At no time do I remember feeling threatened. However, my mom said that my twin brother and I had nightmares and began to walk in our sleep. Mom always felt that what happened or whatever we saw in Willow Creek caused these problems. This encounter was very short and happened on Highway 89A between Sedona and Cottonwood Arizona near a bridge crossing a place called Dry Creek. While driving home from work around 10:00PM we were following a car. My mom was driving and she asked me why there was some guy running down the road and should we stop. Then this individual took two steps and crossed the road right in front of us. My mom slammed on the brakes to keep from hitting this individual and she said to me did you see the size of that guy and boy he could really jump. The most interesting thing she said was “I think that was a big foot”. I just looked at her and she said, oh yeah I remember my grandfather talking about them being around here. Her grandfather was a rancher in the area of the Mogollon Rim. This was very interesting because this was the first time she ever mentioned it. I have talked with my family in the area and they told me that there are places near Flagstaff Arizona at a place called Rogers Lake that they do not like going there, because weird thing happened there and that the Great Grand Pa said not to go there. The individual we saw that night as I remember was between 6 and 7 feet tall. Long dark hair and very muscular. He crossed the road and disappeared down the side of the gulley. We did not stop and continued home. We never talked about that night much but mom always believed that Bigfoot always existed. In the Otay Mesa area of San Diego County. While camping with my son and three of his friends about 10 miles off I-8 the sun had gone down. We had just finished eating dinner and the boys wanted to play capture the hide and seek around the camp site. I told them they could, they played around until about 10:00PM until I told them to go to bed. Around 11:00PM when the boys had gone to sleep, I heard some movement around the camp area and so I got up to see what was going on. Near the camp I was instructed to come into the trees. As I walked into the area of the voice I came upon tow Border Patrol Agents. They told me that all of their motion sensors in the area had been set off. They also told me that they were tracking a couple of really big individuals and that we need to pack up our camp and move on. So that is what we did. These men seemed to me very nervous and they were packing heavy. I still do not understand what the circumstances were. I never thought of a Sasquatch in this area. I did listen to a show that described what the some of the Border Patrol Agent had described. I do not know if there was a Sasquatch in the area but I feel like those men that night may have saved me a bunch of problems. I went cutting wood with my daughter Jessica, son Michael and friend Shawn. Shawn was trying to earn money to take my oldest daughter to Prom. We were cutting fire wood to sell. About 12:00 PM my daughter Jessica came to where I was cutting wood and asked me what I wanted. I told her that I did not call her, she told me that I had called her twice. I assured her that I had not. She took an arm load of wood back to the truck. A few minutes later Shawn came up the hill and told me that he had heard some coyotes howling down the hill from where we were. He said they had just started up. I told him to keep an eye out and let me know if they sounded closer. He grabbed some wood and went back to the truck. A few minutes after about 1:00 PM, Jessica and Shawn came back after hauling wood down for Michael to stack it in the truck. They wanted me to come down and eat some lunch and to see if we had enough wood. So I went back down and ate lunch. After a few minutes I went back to cutting would and all three kids came up to where I was. Jessica asked me if why I was giggling and what was so funny. I just kind of looking at them. Jessica told me she and Shawn heard some little kids giggling and asked if I heard them. I said no. Then my son came up the hill with a puzzled look on his face. He told me he went down the hill to go to the restroom, when he came back to the truck he said all of the wood was thrown out of the truck. He wanted to know if I wanted him to restack it. I told him to go down with Jessica and Shawn and restack the wood. Within a few minutes Jessica was back telling me that all of the food was gone out of the ice chest. She also said they heard that giggling again I ask them if the wood was restacked and she said the truck was full. Michael my son yelled up the hill and said everything was packed up so Jessica and I went down the hill to the truck. Michael and Shawn were standing on the driver side of the truck and Jessica was in the cab. Shawn walked to the back where I was standing and told me that there were two guys further down the hill watching us. We all got in the truck and started driving down the hill. Shawn kept looking out of the driver’s window and he told me that those guys were following us. When we got back to the road Michael and Shawn both said they saw the tall guys run back up the hill. The kids were quiet all the way home about 1 hour. 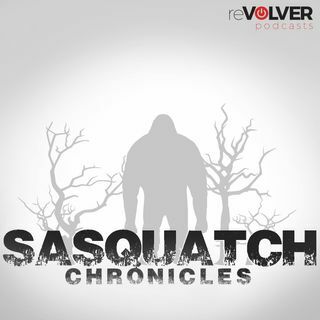 In the last few months I have talked with all three kids by themselves, they all told me the same story and they told me they saw and heard a couple or more Sasquatch in and around the where we were cutting wood. Jessica told me that she sometimes has dreams about that day. Shawn has moved to Alaska and he will only talk about it with Jessica and Michael. Michael told me that he remembers the pair of Sasquatch watching us and that he thought they threw the fire wood out of the back of the truck. My son Michael and I were cutting wood. I was setting on the tail gate of our truck watching my son cut up a tree. I noticed some movement behind him, a small group of Cow Elk came up and stood within a few feet behind him. They were acting really nervous, I thought it was really strange that the Elk were so close. I got Michaels attention and he was nearly face to face with the Elk. We heard what sounded like a large bear roaring coming from the scrub oak. The elk took off and ran pass my truck. Michael came up to the truck and said did you hear that. I told him I heard that roaring sound. So we did like the elk and took off. We talked about what happened all the way home. He asked me if I told mom and I told him that I would but, his mom is a skeptic.